The Alberta Readers’ Choice Award is exactly what it sounds like: we vote, an Alberta author wins $10,000. With two weeks left, things are heating up; each night this week, Edmonton Public Library is hosting a Twitter chat dedicated to one of the short-listed titles. Check out #AlbertaReadersChoice at 7:00 pm Monday through Friday this week and vote here. Here are my mini-reviews, in order of Twitter chat appearance. I wasn’t interested in this book when it came out. 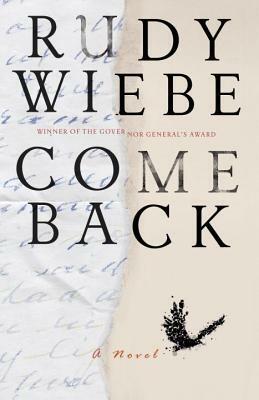 I thought the title meant *Come* Back, as in, “don’t call it a.” When I realized it meant Come *Back* as in, a grieving father calling to a long lost son, and when I saw Wiebe speak about losing his own son to suicide 30 years ago, everything changed. I had to read this book. This story moves between Hal’s stream of consciousness and his son’s journals. Hal’s mental state is a little disjointed to begin with (aren’t ours all) and as he follows his son’s thoughts through the months before his suicide, he has moments of clarity, but there’s no tidy ending here. Hal is reading the journals, finally, because, impossibly, he saw long-dead Gabe walking down the street, and slipping away into the crowd, just out of reach. It’s an irresistible premise and the story didn’t go where I thought it would, at all. This book is challenging and tragic and confusing. There are plenty of Edmonton references and landmarks for the local reader. I’m just glad I finally discovered this prolific Edmonton author. 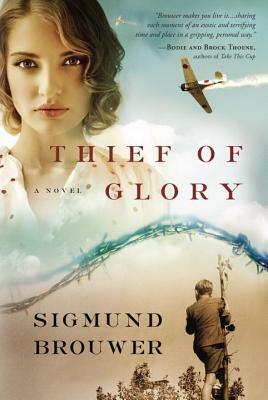 I had a lot of problems with this book and couldn’t finish. I was interested in the premise, which, like Wiebe’s, is semi-autobiographical: a boy comes of age in the Dutch East Indies during the WWII Japanese occupation. He becomes his mother’s and siblings’ protector in a Japanese concentration camp. Brouwer’s father endured something similar. However. I knew I was in trouble when I realized it was an “Inspirational” novel and that “Inspirational” was even a genre. I gave it a chance… I mean, I read novels with religious overtones all the time. David Adams Richards is one of my favourite authors, after all. But the writing is just not good. It’s repetitive, and the foreshadowing is constant and clunky. The story was hard to take, too. Insta-love is bad enough, but when it’s a ten year old, it strains credulity. I noticed some grammatical oddities as I read, and when I came across a paragraph that was clearly copied and pasted incorrectly (a thought ends mid-sentence and is repeated two lines later,) I was done. This is the last hold I’m waiting for at the library. I’ve heard good things, though this is not a book I would pick up on my own. If I can squeeze it in before Aug. 31, I will! You could describe this as Pilgrimage by Diana Davidson for the YA set. Even the snow-white covers are similar. But rather than Davidson’s realism, Boorman has a very interesting premise for her story of settlers and Metis getting through the Alberta winter: An alternative history in which colonization in the West is a failure. The few surviving Metis, English settlers, and French settlers retreat to a fortified village and are completely cut off from the rest of the world for nearly 100 years. I’ve noticed that a lot of YA is told from a single, first-person perspective. I find it limits the story. I could have done with the perspective of a village elder or a someone of a different caste within the village. As it stands, we have Emmeline, beautiful and kind, but marked by a physical disability and by a family secret. She will find out the truth about the outside world. She will expose the corruption of the village Elders. She will also kiss the cute boy. 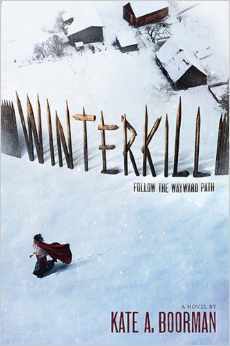 I liked the writing and the premise a lot. I didn’t like the old-timey language that was charming at first, but inconsistent and a bit much later on. The story was at times very compelling and original, and at times bogged down in YA cliches. A bit uneven, but I’m glad I read it, and would recommend to fans of YA/historical/dystopian fiction. I’ve seen Bishop speak about this book so many times, I feel like I’ve read it. I’m only 10% through, and so far, I do recognize a few of the anecdotes, but his style is very conversational and smart, so it is far from boring. 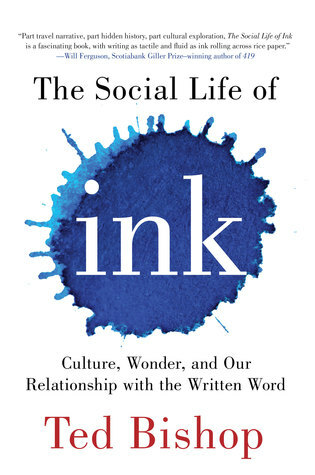 I’m not much for object biographies (yet) and I’m not much for the exaltation of paper and ink over ereaders (I’m reading this on my ereader!) so it’s hard to say where this one will land. Bishop’s slick though – he was the only one handing out swag at the author event, and they were Ink-branded temporary tattoos. That’s brilliant! Yes, I chose the literary fiction. Shocking! Your comment about a lot of YA being told from a single perspective is really interesting, because I’ve noticed a ton of dual narrative YA over the past year or so. For a while, I was so tired of dual narrative, but I think I’m swinging back to enjoying it again. I probably don’t read enough YA to make such a sweeping statement. The YA I’ve read has all been single perspective. Can you recommend something with a dual narrative? Here are some I’ve read this year so far! Silver in the Blood, Althea & Oliver, Black Dove White Raven, and I’ll Meet You There. Also, I’m currently reading the His Fair Assassin trilogy by Robin LaFevers, which isn’t precisely dual narrative, but each book is told from a different perspective, which is really interesting! I haven’t read anything by Rudy Wiebe, but I remember him from this Globe and Mail article about whether or not CanLit could be funny. His book sounds very interesting. Thank you for reminding me! It helped me look smart in the Twitter chat about this book tonight! I remember that article. He seemed like such an old crank. In person he comes off much kinder and gentler. But yeah, there are zero laughs in this book. Who by Fire is another one I wouldn’t have picked up on my own, but, when I did, and saw a blurb from David Adams Richards, I was excited! It makes sense, DAR writes so much about forestry and pulp industry in New Brunswick, this is like the Alberta version of that. Now to see if I finish the thing. I read 15 pages before the Twitter chat and have too many books on the go right now!